The argument for "choice" is simple. The abortion debate is unending. Since people will never come to a consensus, we should just leave it to the individual conscience. "Now that I'm safe, I'm pro-choice"
It's an appealing position, because there are many issues where a "choice" approach is completely appropriate. Take religion, for example. There is a huge diversity of opinion on religious matters, beginning with the basic question of whether or not a deity or deities exist, and continuing down to the tiniest doctrinal detail. Many communities and nations have tried to force a consensus, with disastrous results. A religious consensus is extremely unlikely, if not impossible. Therefore, the founders of the United States wisely took a pro-choice stance on religion in the First Amendment. But freedom of religion has its limits. If the Westboro Baptist Church crazies ever progress from picketing to outright violence against gays and lesbians, they will not be able to avoid criminal penalties on the ground that it was a "matter of individual conscience." Choice does not extend that far. Every human being—male and female, young and old, citizen and non-citizen—has a fundamental right to be free from violence. 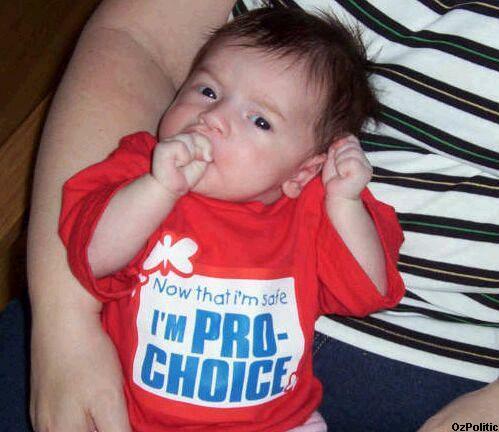 And that is why abortion cannot be defended on the basis of "choice." We cannot simply ignore the harm to the unborn child. That harm exists whether or not a majority consensus acknowledges it. Of course, the pro-choice argument on abortion has another fatal flaw: as soon as a pro-life consensus does emerge, its premises collapse. For several years in a row, pro-life Americans have outnumbered pro-choice Americans. This trend is especially strong in young adults, the builders of our future national consensus. No doubt these polls were a factor in Planned Parenthood's recent decision to drop the phrase "pro-choice."